I've long believed that some sort of telepathy exists between humans. If you're thinking about someone with whom you're emotionally connected, it seems only natural that there's a strong probability that they're thinking about you, too. That's why I wasn't terribly surprised to receive a text message from Stéphane at the exact moment I snapped the above photo of Notre-Dame de Reims Cathedral. Even though my husband was thousands of miles away in Egypt, or was it Turkey (? ), he knew that I was about to enter the place that he had been trying to persuade me to visit for the last two years. It all started when Stéphane proposed a trip to the almost-impossible-to-pronounce, for Anglophones at least, city of Reims in 2012. His goal was to visit the UNESCO World Heritage Site where the kings of France were crowned. My goal was slightly less lofty. I wanted to visit as many champagne houses as possible. Needless to say, I'm unabashedly guilty of hijacking Stéphane's and my two trips to the Champagne region. To date, he hasn't seen the inside of Notre-Dame de Reims Cathedral, but he did get to listen to me tell him that it's a "must-see" sight after I visited it with Jon at the beginning of April. From 1027, all the kings of France have been crowned at the cathedral in Reims with the exception of Louis VI and Henri IV. Placing his hand on the Bible, the Prince would swear to respect justice, uphold the law and defend widows and orphans. Upon the presentation of the spurs and sword, he became the first of the knights. Following a long prayer and nine anointings consecrating him as the King of France, he received the symbols of royalty: the cloak and ring, sceptre and the hand of justice, which Jon and I somewhat irreverently nicknamed the face-slapper because that's what it resembles. Between 1027 and 1825, 29 French Kings were crowned in Reims. The Cathedral, formerly the Abbey of Saint-Rémi, earned this honor because it housed the Sainte-Ampoule, a holy flask containing the sacramental oil that transformed men into kings. It was said that an angel, in the form of a dove, delivered the holy flask to Saint-Rémi when he anointed Clovis King of the Francks on December 24, 496. Not surprisingly, the original holy flask was shattered during the French Revolution. A fragment of it was incorporated into the replica on display in the Cathedral's treasury. When I reached the rear of the Cathedral, I suddenly spotted a collection of stained glass windows that reminded me of the famous ceiling at the Palais Garnier in Paris. I wonder why Stéphane didn't tell me that the windows were created by Marc Chagall, the talented Russian born French-Jewish artist!? I only noticed the gold fleur-de-lis when I took this photo and was delighted to discover the archer in the top left corner when I uploaded my pictures onto my laptop. I don't think I loved it when I went, the light show they had on the facade for the 800th (?) anniversary was fabulous though! The first photo at the top, wow. The flowers! The spring! The sky! I love it. 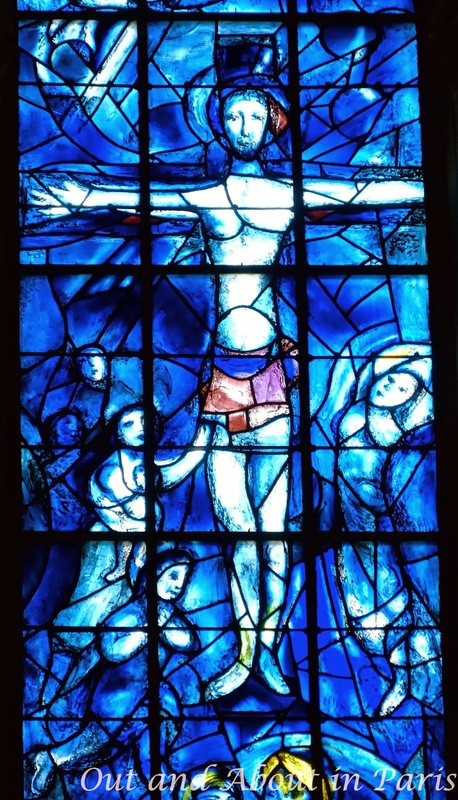 And I adore Chagall, his blue windows at the MIA in Chicago are my favorite! Spring was exceptionally grand in France this year. I hope that it has finally made its way to Boston! 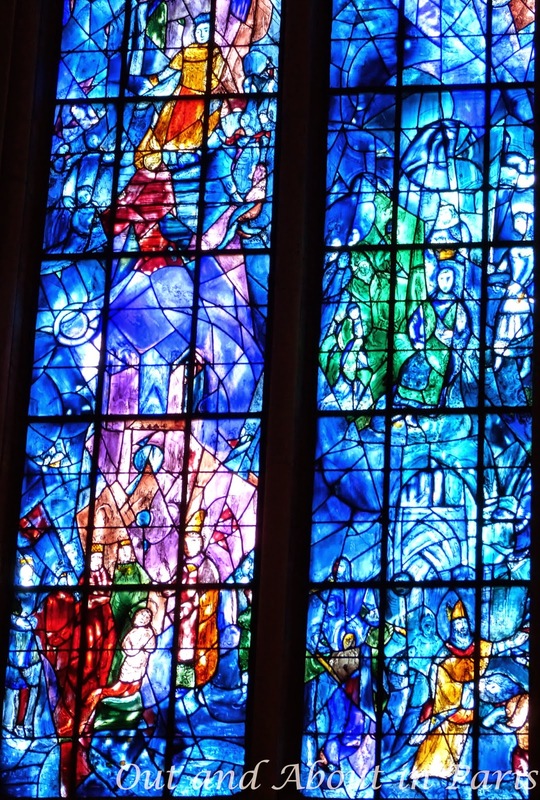 I read online that Chagall's blue windows in Chicago are supposed to be amazing.